In a surprise even to me, a very interesting bicycle came up on E-Bay Deutschland just before Christmas and my rather low bid was the winner, so now I have added a German fixed gear 1960s track bicycle to the Herd of Tin Donkeys. The bike looked irresistible in the photos and today I picked it up in a small town between Bonn and Cologne and found it to be as advertised. I paid just a bit more than I would have for a new mass-market Bianchi Pista made in Taiwan. The Bauer-Werke, which manufactured carbide bicycle headlights, was established in 1911 in Frankfurt and moved to nearby Hanau (Klein-Auheim) in 1914. Hanau is the town where the famous Grimm Brothers, of fairy-tale fame, were born. The company began to build complete bicycles in 1922 and continued to do so until going bankrupt in 1968. The company also manufactured a range of small motorcycles and even built an engine in-house for them. 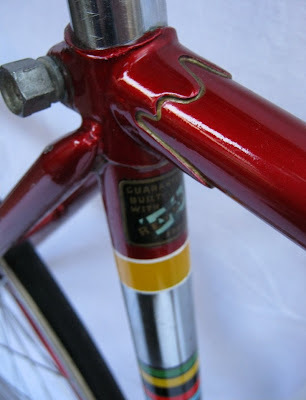 The bicycle range was quite broad and the racing program included Reynolds 531 frames built with either in-house lugs with nice cut-outs (as is the case of my bike) or curly Nervex lugs. Track frames are, unsurprisingly, quite rare. There seems to have been a factory team, and Bauer bikes did appear in the Tour de France as well. In 1936, the Rund um Berlin road race was won by Fritz Ruland, racing for the RV Bauer Klein-Auheim team and there was a Bauer Preis race in Gross-Auheim. 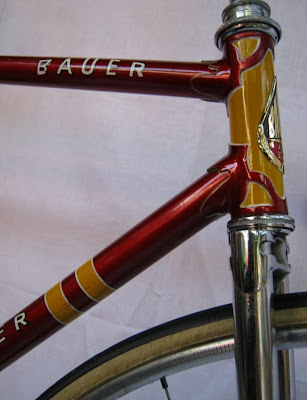 In 1952, Heinz Müller, riding a Bauer, won the professional World Championship on the road and the upper-range models subsequently were festooned with the rainbow stripes. Incidentally, Müller was the first of only two German pro world champions, although five German women have won the title. Post-1961 Bauer bicycles had a "50" included in the headtube badge to note the 50th anniversary of the founding of the company. 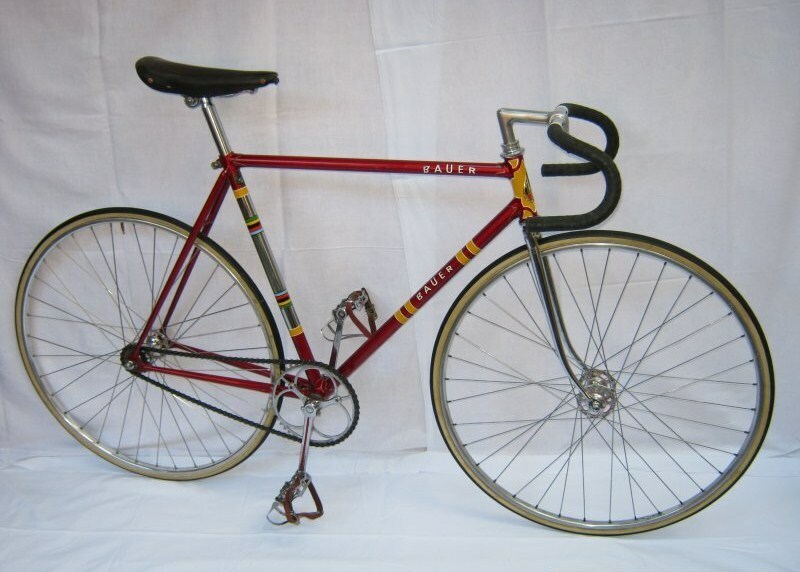 The company was building over 100,000 bicycles annually but clearly not at a profit as it went broke 43 years ago. The Bauer name was purchased in 1968 by another firm, which continues to build city bikes under the brand. There is still a street in Klein-Auheim named after the founding Bauer brothers. I gather that the Bauer company was held in some esteem in its heydey. 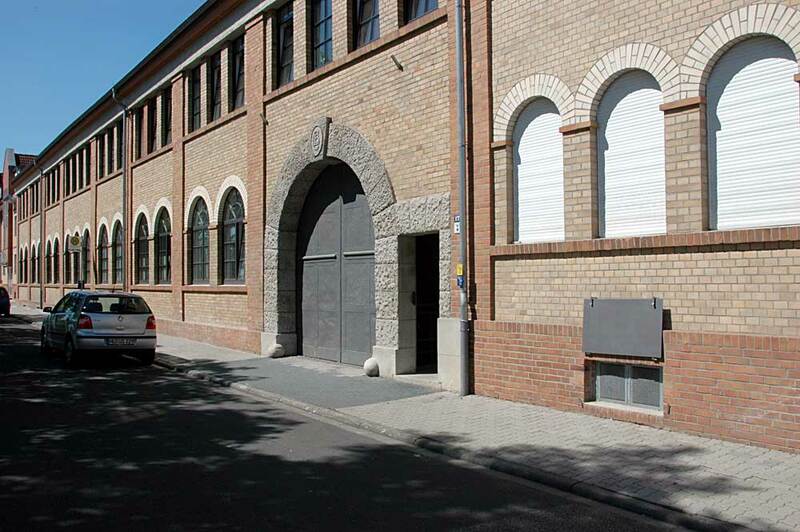 The factory building still exists but has been renovated into apartments. My bicycle seems to be in very good original condition, at least with respect to the frame. I have some doubts about the originality of the Campagnolo components, which look somewhat newer but are still quite attractive. The stem is definitely wrong but I am not sure I want to pay much to replace it with a period track stem. Cinelli stems were used then but also an obscure Belgian brand named Titan, which I am sure is unavailable at any price and probably not roadworthy any more if used. The bike is surprisingly light but then again it has no brakes or variable gears. I have never ridden a track bike and although the fork is drilled for a brake I will probably not use it on the street. I am fortunate that here in Düsseldorf there is actually a covered bike track and perhaps I can re-enact the Good Old Days there...once the snowstorms keeping everything shut down here have ended!